Welcome to our website, here you will always find many beautiful and useful patterns. Today the pattern I bring to you is very beautiful and delicate, it is the famous amigurumi animal. For you who have never heard of the amigurumis that have the Japanese origin name are pieces of animals that are made of crochet and lined inside. They are cute and charming for decor and gifts. It seems difficult, but it is not, nothing like practicing is not really. 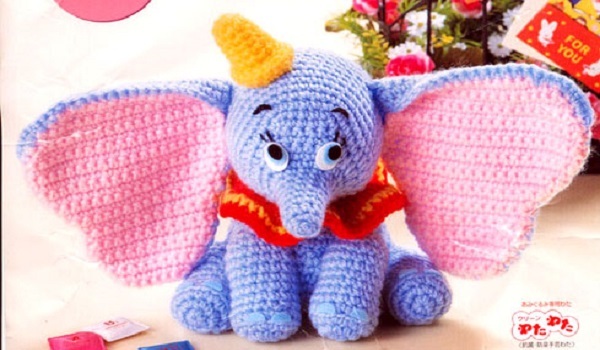 This amigurumi pattern of the Dumbo elephant is very beautiful and charming, there is no way I do not like it and I'm sure it will enchant everyone with it. Below I have photographed him in his final result for you to see how he stays and also inspire you with colors and do beautiful work. Amigurumi patterns are always lovely to see and also being fun to make. Great for gift or for decoration. Many people know that they sell their crochet pieces at the end of the month to have an extra income, and this pattern is great for making money because it is very difficult not to like animals and these cute things made of crochet. The amigurumis are highly valued, thus being an artisanal piece that has cheap cost and can profit well. Below I leave the step by step written with all the tutorial of this beautiful pattern of the crocodile Dumbo elephant. Enjoy our fanpage Xell Crafts and always see our news. See the tutorial below. Make a current of 30pc, join the first PC to create a ring. Fold the last line to create a curb. He now continues with part of the head, now working for lines! In the circle. Now to start again in the opposite half of the language, 7 puntos bone before the tab. From now on we will only work in blue, the pink part is then resume. 26: 5PE, 10bp (15) cut the wire and camouflage. 26: 10 bp (10) and cut the wire camouflage. Collect the last two parts made separately (line 22) and make dc in blue all to unite them around to create a border. From now on we will only work in pink, blue part is then resumed. Collect the last two parts made separately (line 22) and dc in blue to unite them to create a border. • Cut in black and white, oval blue in size and glue down or sew to create eyes. • Semi-oval cut and paste or sew 4 feet blue to create nails. • Eyelashes and eyebrows with black stitching lines.